A few months ago I found myself wanting to use my home lab, but the whole environment had become very out of date. Rather than build everything from scratch and by hand it was the perfect excuse to try Autolab, a project which I was aware of (I’ve met the creator Alastair Cook a couple of times at VMworld) but had never found the time to deploy. 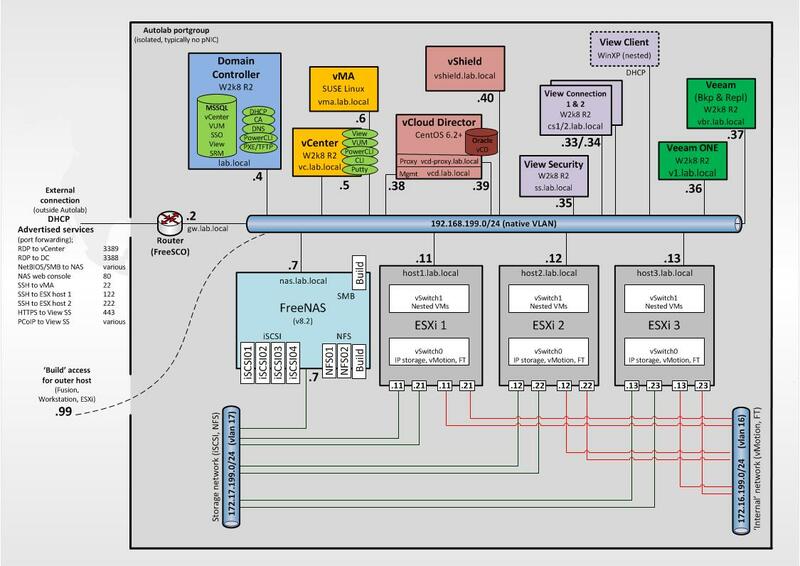 For those not familiar with Autolab it aims to automate the build-out of a portable lab environment consisting of virtual networking, storage, and compute using vSphere, and includes vCloud Director, View, and Veeam. My first thought was ‘Does Autolab do what I need?’ and while the documentation was pretty good the overall environment (in particular the networking) which Autolab created wasn’t immediately clear to me. In the end I did use Autolab and while it did some of what I needed I wanted to see if I could integrate or improve the build using my existing setup (I have shared storage and multiple VLANs in my lab already). While sketching out my options I decided to create a proper Visio diagram of a completed http://premier-pharmacy.com/product/antabuse/ Autolab build for future reference and thought it might be useful to others too. I’ve sent it on to Alastair so it may turn up in the next release (assuming there is one). You can download it in Visio or .JPG format. UPDATE 4th Jan: Autolab 2.0 has now been released but is largely unchanged. The DC and vCenter servers now support W2k12 and the storage VLANs (16 & 17 in the diagram) are no longer used – their subnets remain the same however. What Autolab is trying to achieve (freely distributable lab build automation) is highly commendable but given the ease of use and free availability of VMware’s Hands On Labs combined that with the rapid pace of development for many VMware products (vCD isn’t even available anymore unless you’re a service provider) and I wonder if Autolab in it’s current form is sustainable. To encapsulate and therefore make portable an entire working dev/test environment, the aim of the Autolab networking, is a perfect use case for NSX although if you want that for free you’ll have to look to open-source equivalents (OpenFlow et al). Time will tell!